"When the mysterious light first appeared it was seen moving rapidly from the northeast and heading in a southwesterly direction. As it neared the southern boundary of the city of Sacramento it turned directly toward the west and after passing the city went south, being distinctly visible for upward of 20 minutes." -From the San Francisco Call, Nov 26, 1896--This light was observed by many prominent individuals including Deputy Secretary of State George A. McCalvy, District Attorney Frank D. Ryan, and E. D. McCabe, the governor's personal secretary. "[The Airship] looked like a great black cigar with a fishlike tail....The body was at least 100 feet long and attached to it was a triangular tail, one apex being attached to the main body. The surface of the airship looked as if it were made of aluminum, which exposure to wind and weather had turned dark....The airship went at tremendous speed. As it neared Lorin it turned quickly and disappeared in the direction of San Francisco. At half past 8 we saw it again, when it took about the same direction and disapeared." "The matter is the most highly classified subject in the United States government, rating higher even than the H-bomb. Flying saucers exist. Their modus operandi is unknown but concentrated effort is being made by a small group headed by Doctor Vannevar Bush." Maroc-Presse reported that one of its employees, Mr. E., driver of a delivery truck, "a man of sane judgment and excellent eyesight," observed an object flying over the Beth River. 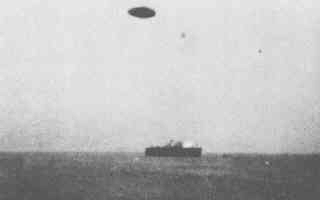 "I am positive it was not an aircraft or any known machine but a circular, flat craft which had the appearance of copper. It flew normally for some time, then it suddenly flipped over. Therefore, I was able to see the whole disk and was amazed when it came down into a field where it landed on edge, very gently. Almost immediately it rose into the sky at great speed, resumed its horizontal position and was soon lost to sight." 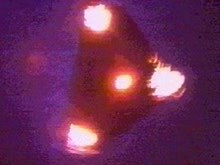 The Jacques Vallée "Magonia" UFO landings database 326. For quite some time, no diesel engines had been affected whatsoever, but only those operating by internal combustion. For example, a UFO passed over two tractors in Forli, Italy, on November 14, 1954, one tractor with a diesel engine, the other with an internal combustion engine. The engine of the diesel tractor continued to operate, but the other tractor's engine stopped and could not be started until the UFO had vanished (4). There are other cases, particularly in the United States, where diesel trucks' engines were not affected by a UFO, but their headlights or radios ceased to function. Since at least 1974, though, this dichotomy has not remained intact. On March 21 of that year, a diesel truck in Spain was totally disabled in the presence of a UFO (5). This case and others that probably exist are perhaps another indication that the UFO phenomenon varies with time. At 4:30 a.m. near Hot Springs, South Dakota a USAF fighter jet from the 54th Fighter Squadron made three passes at a brilliantly lit UFO that was bobbing up and down. On the third pass the UFO was picked up on radar by the 740th ACW squadron. East of Pierre, South Dakota on highway 34, two police officers sight a UFO that plays a game of cat-and-mouse tag with their patrol car. At around 7 p.m. on the same day Mary Whelan was walking a colt on her farm in Reading, Minnesota when it was spooked by six disc-shaped objects that flew over in a semi-circle. Others horses were also frightened when these UFOs made 5-6 more passes in formation following the same maneuver. The discs gave off a green light as they flew past. (from -- Minneapolis Star, November 28, 1956; Leonard Stringfield, CRIFO Newsletter, January 1957, p. 2; Jay Rath, The M-Files: True Reports of Minnesota's Unexplained Phenomena, p. 47). On a chilly November night in 1964, I was taking time exposure pictures of the infrequently clear skies over Ann Arbor, Michigan. When the 35mm slides were developed, I was initially disappointed to have not captured any meteors or satellites for my school science project. What did appear on the intriguing image was an apparent formation of UFO's! Needless to say, the science project changed from meteors to unidentified flying objects...a line of inquiry that fascinates me to this very day. Thanks to Bill Stanley for permission to reprint his photo, ©1999 Bill Stanley. New York State as well as portions of six neighboring states and eastern Canada were plunged in to darkness for several hours. Besides the loss of power, the blackout triggered sensors that placed the Mt. Weather facility (to house the president in time of nuclear attack) on red alert. There were also a number of reports of anomalous lights, and speculation that the blackout may have been the related to UFO activity in some way. A very credible UFO encounter occurred in Delphos, Kansas in 1971. Sixteen year old Ron Johnson, along with his dog, was tending the family sheep when his attention was suddenly drawn to a mushroom-shaped UFO appearing in the night sky. It would be on November 2 that Ron would encounter this craft, which was covered with multicolored lights across it's metallic surface. Incredibly the UFO was only about 75 feet from him, and it hovered only a few feet above the ground. Ron estimated the craft's diameter at 6-8 feet. Stunned by what he was looking at, he tried to get a closer look, but the brilliant luminance of the craft did not allow him to make out any additional details. Unlike many other UFO reports, Ron described the craft as making a loud sound, "like an old washing machine which vibrates." The glow of the object's bottom increased as it began to shoot up into the sky. Ron would later state that he was temporarily blinded by the brightness of the craft as it ascended. After he regained his sight and composure, he ran back to the family house to alert the others. The bright glow was now high in the sky, as it began to vanish from sight altogether. Three family members came running around the side of the house to get a glimpse of the unusual phenomena. They arrived at the location, and were shocked to see a glowing ring in the ground, right below where the craft had hovered. Family members would later relate that the ground around the glow. "felt strange, like a slick crust, as if the soil was crystallized." Ron's mother's fingers went numb, like she had been given a local anesthetic. Seeing nothing else of the craft, the family finally settled down for the night. When dawn broke the next day, the family immediately returned to the sight of the glowing ring, and to their surprise, it was still there! The inside and outside of the ring were damp from a rain shower, but the ring itself was amazingly dry. The ring had a crusty appearance, as though the rain had simply ran off, leaving it bone dry. Slightly over a month later, after a snow fall, the white ice had melted both inside and outside of the ring, but the ring itself maintained the snow drift. Investigators experimented with the ring by removing snow from a section of it, and pouring water on the exposed part. The soil would not allow the water to pass through. Further experimentation showed the ground under the ring to be dry to a depth of one foot. The ring itself was composed of a whitish substance, which was sent to a laboratory for analysis. The findings were as follows: [it was resolved into fibers which] were vegetal in nature and belonged to an organism of the order of Actinomycetales, which is an intermediate organism between bacteria and fungus... family actiniomycete, genus Nocardia... [and is] often found together with a fungus of the order Basidomycetes, which may flouresce under certain conditions... one possible interpretation is that high energy stimulation triggered the spectacular growth of the Nocardia and of an existing fungus, and caused the latter to flouresce. 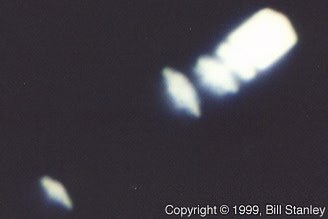 The experience of Ron Johnson is still considered as one of the best documented "ground trace" UFO cases of the past century, and is considered "unexplained." November 9, 1974 - Pennsylvania UFO Crash? A glowing object fell into a small lake outside town. Three teenagers saw it fall at 7:30 p.m. on a Saturday. They observed a yellow-white glow under the water that shifted to a point 25 feet offshore. The boys were kept in a police car for three hours while a number of vehicles with floodlights and cranes removed a disc-shaped object and put it into a van. The following Monday, a railroad lantern and battery were recovered from the lake and officials called the whole thing a hoax. Hoax? Or cover story? November 5, 1975 - The Travis Walton Abduction: Real or Hoax? On November 5, 1975, a 22 year old logger by the name of Travis Walton was allegedly abducted by a UFO near Snowflake, Arizona. Witnessed by six companions, his experience is possibly the most unique and controversial alien abduction tale in the short history of the phenomenon. Now, some seventeen years later, Paramount Pictures has brought this incredible story to the silver screen. On March 12, 1993, Fire in the Sky opened in theaters across the country. Scripted by Tracy Torme', who also wrote last year's CBS miniseries on alien abductions, Intruders, the movie is loosely based on Walton's book, aptly named _The Walton Experience_. "Loosely" because Torme' has significantly altered the portrayal of Walton's experience on the UFO from what Walton himself described, because Torme' has created a fictional UFO investigating organization to replace the real group involved, and because Torme' combined several real individuals into "composites," all for the sake of literary license. However, after examining the full evidence of the case, he may be forgiven these fictionalizations -- for how can one be too critical of fictionalizing a work of fiction? Philip J. Klass, chairman of CSICOP's UFO Subcommittee (which also includes such noted skeptics as Robert Sheaffer and James Oberg), investigated the Walton case immediately after it occurred. As detailed in his book _UFOs: The Public Deceived_ (Prometheus, 1983), in the months following Walton's disappearance, Klass found significant evidence of "gross deception." South Herwang, Indonesia. By 2:00pm, engineer Tony Hartono had taken a series of photographs of an off-shore oil rig that his employer ARCO was building. He was shooting from a launch. With his last exposure, his took this photo as he looked at the ocean. The object appeared a yellowish color as it approached quite near to him after his last photo was snapped. In 1976, Joyce Bowles, 42, and Edwin Pratt, 58, were driving near Winchester, England to pick up the woman's son and girlfriend from a farm at 8:50 p.m. when they notice an orange glow in the sky. They turned down a narrow lane and immediately their car began to "shudder and shake as though it were coming to pieces." The car was pulled diagonally off the road. When the car came to rest they saw a glowing, orange, 15-foot-long cigar-shaped object about 5 yards in front of their car, hovering 12-18 inches from the ground. They were both badly frightened and the driver turned off the engine. 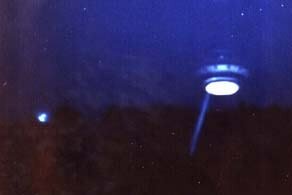 The UFO appeared to have jets beneath it from which a vapor was issuing. In the top left portion of the craft was a window, through which they could see the heads of three men. A 6' tall man with a slim build, wearing a silvery suit, emerged by passing through the side of the object. He had long blonde hair, a dark beard, and his skin was pale. Just as he approached the woman noticed a "whistling noise." Reaching the car, the man bent over, placed one hand on the roof, and looked inside. His eyes were pink "like an albino rabbit," and were so penetrating that when the woman looked away she could still see spots of light as an after-effect. She also felt that the man transmitted some kind of influence that caused them to remain calm. The being stood at the side of the car for 2 minutes, then moved away to the rear of the vehicle. He did not reappear, and when they again looked forward the UFO had disappeared. (Sources: Leslie Harris, FSR, February 1977 (Vol. 22, No. 5), p. 3. ONE family claimed to have been abducted by visitors from outer space while travelling through North Wales on November 10, 1977. On the same night an elderly man from Llandudno had been frightened by unusual beams of light in the sky above the Great Orme. The family were driving near the village of Llandernog, Denbighshire. They saw a purple triangular craft which then swallowed up their car. The purple object seemed to vanish. The family had lost several hours but could remember nothing about what had taken place during that time. Meanwhile, another man driving along the Llandernog road that night claimed he saw a spaceship as big as a football pitch with hundreds of bright lights emanating from it. The man whose family were abducted was reportedly instructed by the RAF not to speak publicly about what had happened to him. "Several days in a row we sighted groups of metallic, saucer-shaped vehicles at great altitudes over the base [Germany, 1951] and we tried to get close to them, but they were able to change direction faster than our fighters. I do believe UFOs exist and that the truly unexplained ones are from some other technically advanced civilization." One of the documents from the "Blue Folder" describes a UFO encounter that happened in 1984 in Turkestan Military District. Anti-aircraft defense system near the city of Astrakhan "notched up" the object that flew along the Caspian Sea coast at an altitude of 2000 meters above sea level and was heading to the frontier. It did not respond to the interrogations. Its shape resembled a sphere. Two fighters were scrambled, but all the attempts to shoot the UFO down failed. Moreover, when the object was fired at, it descended down to one hundred meters above the ground to an altitude that made further firing by the fighters impossible. It is necessary to mention that despite the firing, the speed of the UFO did not change. During the flight the object passed above several military unit locations, and this made it possible to take photographs. When the UFO approached the town of Krasnovodsk, a helicopter was scrambled to make an attempt to shoot the intruder down, but the UFO quickly climbed and hovered at the altitude that was inaccessible for the helicopter. After the pilots had spent all their ammunition the helicopter descended for landing, whereas the UFO sharply changed its course and headed toward the open sea. Soon after, the object disappeared from sight and was lost by radars. In 1985 a radar station under Captain L. Valuev in the Krasnovodsk region registered an unknown object at an altitude of 20,000 meters. Its dimension was about 1000 meters! The object did not move, but after some time a small disc having a diameter of approximately five meters flew out of the large object. This smaller disc-shaped UFO landed at the Krasnovodsk spit. Patrol-boats of Kaspian flotilla rushed to the landing place of the UFO, but when they approached it at a distance about 100 meters, the UFO took off and flew away for about a kilometre. Patrol-boats approached the UFO again, and it again flew away from them. The situation was repeated five times! Finally the object went up with tremendous speed. Its mark on the radar screen coincided with the mark of the mother craft, and then the large UFO went off into Space. Another "Blue Folder" report reads: "On the 25th of November, 1986, at 12:50 Moscow time civil flight control service as well as the military department of that service in the airport of Magadan (a city in Eastern Siberia) discovered an unidentified target. At that time the aeroplane ÀÍ-12 No 11421 was approaching the target at the altitude of 7200 meters. The captain of the plane was warned by traffic control service about the situation. "When the plane and UFO passed clear of each other the object turned right in the direction toward Shelekhov bay and raised its speed to 900-1000 kilometres per hour. The growth of UFO speed continued and at 13:00 it achieved 3000 kilometres per hour. Retaining this speed, the object moved away to the shore of Kamchatka, and at a distance of 150 kilometres from the coastline it disappeared from radar screens." Ed Walters, a resident of Gulf Breeze, Florida and building contractor, photographed in excess of 40 extremely clear and convincing "flying saucers" over the course of several years, but the greatest concentration of images between Nov-Dec of '87. Though examined by photographic experts and said not to be fakes, there still remains considerable controversy over Ed's photos. Many believe Ed used a simple reflection technique to create his UFOs. A plastic model was discovered by a teenager, Tommy Smith (who also claims he helped Ed fake the photos) hidden in the attic of Walters' home that closely resemble the strange, "tub like" space craft in his pictures. This was later disputed as being untrue and claims were made that the model was planted to discredit Walters. In Ed's book he even had a rather staged photo of himself shaking his fist at the looming UFO which hovered outside his patio window, suggesting he was plagued by the ships to the point that such a photo could have been taken. When Walter's images first came out, many people noticed that they all had a strange ghost-like qualilty to them, possibly indicating either superimposure or the image was in some way reflected onto glass. Quite a number of skeptics reproduced Ed's results almost exactly using the reflection technique. Nonetheless, experts such as Bruce Maccabbe called them authentic and even co-authored a book with Walters. As a UFO case, it simply remains unresolved. Walter's went on to capture the same UFO on video several times and sticks to his story to this day. One thing is for certain, the Gulf Breeze area has been, off and on, a hotbed of UFO activity witnessed by countless others, though no one else has ever photographed "Ed's" particular UFO to date; and yet, Ed's got a scrap album packed with the one UFO type. Ed Walters is the approximate American equivalent of Billy Meier, minus the tomes of transmitted 'knowledge' from the happy space brethren. Two F-16s were ordered to intercept and identify this phenomena, and one of the jet's radars locked the object in. It appeared as a small diamond on the pilot's screen. The pilot reported that only a few seconds after locking on the target, the object began to pick up speed, quickly moving out of radar range. An hour long chase ensued, during which time the F-16s picked up the strange craft's signal two additional times, only to see it fade from view. The triangular craft seemed to be playing a cat and mouse game, and finally was lost in the night lights of Brussels. The pilots of the fighters reported that the UFO had made maneuvers at speeds beyond the capability of their technology, and once the radar showed the craft almost instantly drop from 10,000 to 500 feet in 5 seconds! http://www.rense.com/general18/newwave.htm with personal reports from Dieter Bosh exclusively for Rense.com. 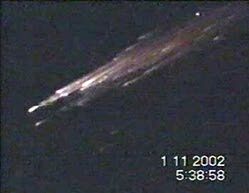 November 24, 1993 - UFO Crash? The incident happened just after 07:00pm on the night of November 24, according to John Ford, chairman of the Long Island U.F.O. Network, who said that it has taken his group six months to do a thorough investigation. It was just recently, though, that his group was able to acquire the video and the photos. "We knew that something crashed into the park that night and we have, bit by bit," said Ford, "been able to finally put the picture together." Several motorists who were traveling along Sunrise Highway that night, according to Ford, contacted his organization and described what they thought was a plane that was going down into the park. And many local residents whose homes border Southaven report that they heard loud rumbling sounds and saw strange lights. One local resident who lives near the park said that for a five to six day period after the incident, his house experienced numerous power surges and the phone would ring strangely without anyone on the other end. "I ride horses in the park so I'm pretty familiar with the activities there," said the 45- year-old man who requested anonymity because of the sensitive nature of his job ("they would fire me if they thought I believed in flying saucers"). "For the next few days there were a lot of military helicopters going over the park --- and I couldn't get in." Records show that Southaven Park was closed between November 25 and 28. According to park officials, the park was closed to the general public that week because it was reserved for duck hunting. Although some of the area fire departments were initially called, they were turned back and the fire was handled by the federally controlled Brookhaven National Laboratory Fire Department, said Ford. Ford's group finally gained admittance into the park a week later. "We found an area that was burned out and some trees were bent over," Ford recalled. "A section looked like it had been plowed over by machinery." But two things were of particular interest to Ford. "We were getting a higher than normal radiation reading in the area, higher than regular background radiation, and the fence line in that area," said Ford, "had no magnetic reading." Ford explained that metal fences maintain a magnetic charge from the Earth. Ford later received what he had been waiting and hoping for: a video film of the crash. "I can't say where I got it from because these people who supplied the tape are afraid that the government will go after them." Because of the poor quality of the tape, Ford has been working with video specialists to try and enhance the quality of the picture and to produce stills. What are Ford's conclusions about the Southaven incident? "We are still very actively investigating this event. We believe that an extraterrestrial craft, with aliens, crashed that night in the park, and we are out to prove it." November 1, 2002 - Soyeuz Debris? UFO Break-up? Meteor Interception? On November 1, 2002, we took off from Antalya at 05.29 for AYT-DRS flight. As we were climbing up to 24.000 feet, at 22.000 feet and 20-30 nm from Afyon, just before dawn, in the direction of 10 o'clock, we spotted a mass of light moving from West due East. Originally, we couldn't understand what it was. As we were watching its movements we thought that it might be an asteroid. But then, taking our previous observation into account, we thought that a shooting asteroid would dissolve in atmosphere in 1-2 seconds. As time passed, we noticed that the movement of this mass of light was quite slower and the mass was too enormous to be an asteroid. It flew away in a straight direction of West-East in a minute. When it got closer to 12 o'clock, we realized that it's quite unlikely for this thing to be an asteroid. From the reddish colour emerging from it, we thought that it might be an airplane in some state of emergency or even about to crash . When it came to the position 12 o'clock, we saw a mass of red light in front of it, small light formations stretching back behind it and one more blinking light on its rear edge as if it were the beacon of an airplane. This thing was definitely not an airplane or an asteroid. It was something like glowing light formations moving together in a bigger mass of light. When it came to 1-2 o'clock position, the mass of light disappeared and the small bright formations moved away. Then they dissolved casting lights. In 5 minutes we saw the trail the object left behind and were able to take picture of it with a digital camera. My personal view is that this was certainly not an asteroid. Considering what I've observed in the direction of 12 o'clock I can say that they were unidentified bright objects and formations flying together.